As it is getting close to Christmas, I thought I would offer a helping hand to anyone who has forgotten to buy a present for their favourite foodie friend or relative. Matt who blogs with Carla at Food for Friends Yeah published a "christmas list for foodie fellas" in November which got me thinking on several counts. The first thought was about sexism and I did complain (!) then Matt published a list for foodie girls so I've shut up! However I loved the idea of his Christmas present tips. To be honest I think that presents for foodies are the most fun to buy, but that is probably because I love everything I buy as gifts but have the dilemma of wanting to keep the presents for myself. Magazines subscriptions are actually a very good gift as the anticipation of each delivery is like a new present every quarter. Fire & Knives is a fantastic literate exploration of food as it relates to life. Bearing in mind that food, and our need for it, is one of the things that bind all humans together, we usually manage to marginalise the wider subject focusing instead on chemicals, packets, recipes and trends. If you want to explore food and eating without a recipe in sight then Fire & Knives is a great place to start, and this first issue has the most quirky short story which is worth the cover price alone. Fire & Knives quarterly costs £20 p.a. to subscribe. 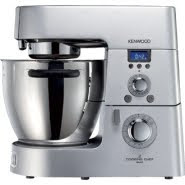 my blog earlier this year here and that is the Kenwood Cooking Chef. This is the sophisticated great grand-daughter of the original Kenwood Chef that my Mum passed down to me. Available from John Lewis (though hurry, there are only 3 left on their website) this machine cooks as well as mixes so taking the hardwork out of tricky staples like hollandaise or bechamel sauces. You can make soup or stew, steam vegetables or even make a chocolate mousse - a whole meal in one machine but you will really have to love the person you give this to as they cost £995 each. Alternatively, if you are making food the old fashioned way, these enamelled individual casserole dishes are really cute and practical. No regular cook should be without a good mandolin, and after I managed to break the slicer blade earlier this year, I have been looking around for a replacement. I have settled upon this as being the best balance of size and cost efficiency. Made by Microplane who have an unparalleled reputation for their graters and zesters, you can be sure that this will be yet another good buy. This also comes with a finger-friendly food holder which will save your finger ends. Available from Lakeland, the last order date for standard delivery is Monday 21st December. Another Lakeland item which are especially good for bigger hands and maybe for the barbecue too, are these silicon mitts. They are flexible, lined and have good insulation capabilities as well as being machine washable. These are sold singly so you would be more popular if you bought two!. They cost £12.79 each and again, are available from Lakeland. The last order date for standard delivery is Monday 21st December. Of course, they say that the best gift to give is something home made. When we used to sell on farmers markets I would to hold back a few handmade chocolates, flavoured nuts and gingerbreads to use as little stocking fillers and gifts for friends and family. I still like to gift people things that I have made myself but I'm aware that sometimes I might be emptying my cupboards to make some space for christmas food - and that isn't such a altruistic notion! This year I have made some sweet dill pickles and ginger carrot pickles to give as gifts. Both recipes mature quickly so even if you make them now they will be ready to eat by Boxing Day with leftover turkey or ham. For chilli lovers, I will be making candied chillis. Once they are made, they are stored in the syrup they are cooked in which is hot, spicy and sweet. The chillis are perfect added to brownies or cookies, and the syrup is delicious drizzled over fresh mango with lime juice. Great list of ideas Kate - I'm also glad I'm back in your good books (I am aren't I?) after publishing my foodie gifts for girls!! Oh dear - I haven't got a mandolin, better get one quick if my "good cook" reputation is to stand. It looks a particularly neat one -how big is it? I heart lakeland! 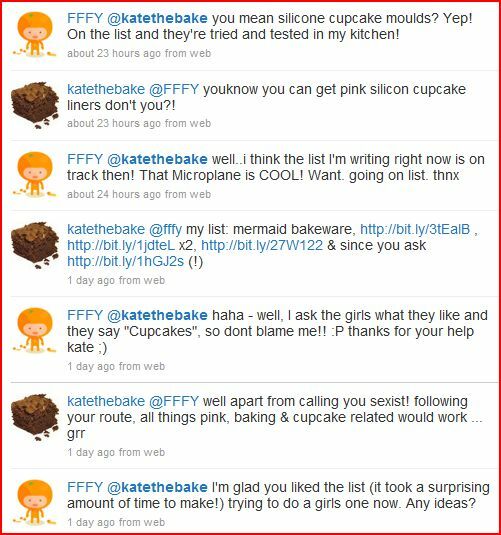 But I was thinking of getting a kitchen aid instead of a kenwood....?Still deciding....btw I've just discovered your blog through ukfba and it's just nice to find another uk fodd blogger that's blogging gluten free. It can be a lonely old world out there!